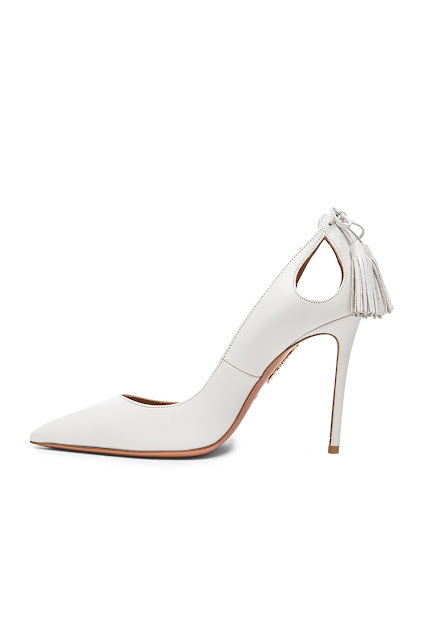 I love the a shoe with a tassel. From gold Coach loafers to classic Bass Weejuns to edgy Alexander Wang Silver heels - the tassel speaks to me. I can't get enough of these shoes. Apparently Paul Andrew can't either. I love the excess of tassels on his Arta Sandals from this Spring. The Aqazzara Forever Marilyn heel incorporates tassels in a more subtle way. I love the heel placement. These will draw the eye as you walk away confidently. I'd love to pair these with a sharp grey suit. And a shoe that made my "must have for Fall" list early, is the Sophia Webster Layla Pom-pom sandal. I WILL find these in my size. Sure tassels can seem preppy or parochial, but these new styles are anything but boring and tame. I love tassels too. Not too fussed on the first two pairs, but love the SW pom poms, so cute!